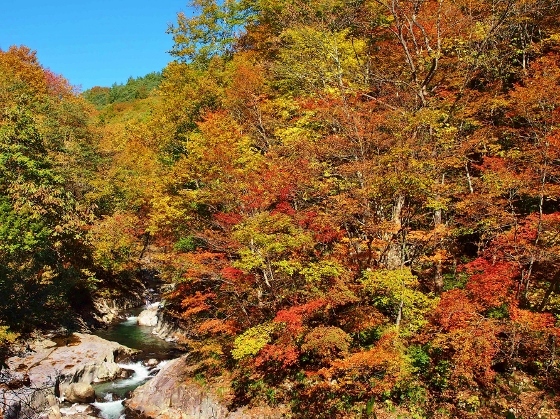 Today I traveled to Urabandai area of Kitashiobara Village to see the autumn colorful leaves. 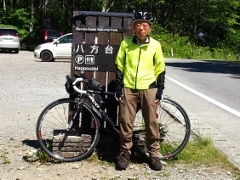 I pedaled through the cycling road along the northern shore of Lake Akimoto and then walked to Nakatsugawa Valley. 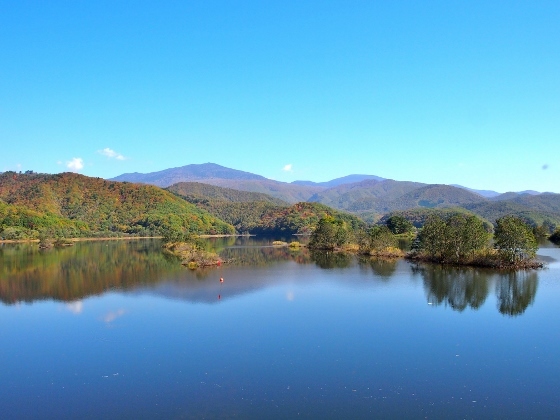 After that I visited a part of the Goshikinuma Ponds. It was a clear Sunday today with a lot of people outside. On the way, I could see a clear view of Mt. Bandai from a local road of Inawashiro Town as shown above. 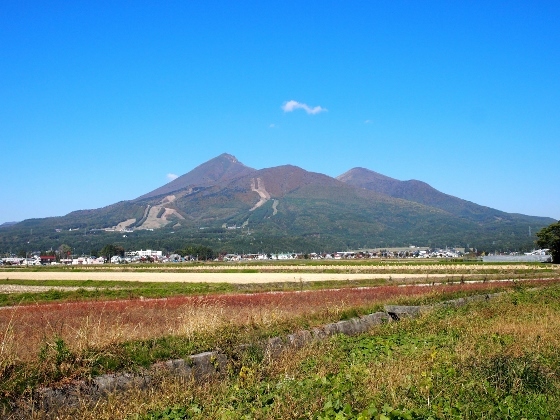 The photo shows Mt. Bandai on the left, Mt. Akahani in the center, and Mt. Kushigamine on the right. These mountains will be snowcapped shortly. 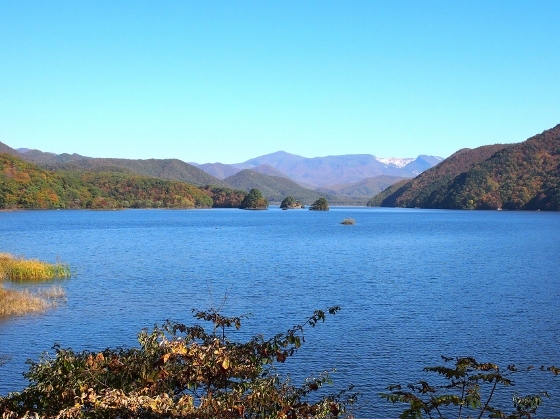 From the south I pedaled on the National Route 459, and soon after entering Urabandai area I turned right towards Lake Akimoto. After a while I turned to left to pedal on the cycling road along the northern shoreline of Lake Akimoto. This road is also open for cars though the road is very narrow. I soon found the place for a viewing spot of beautiful Lake Akimoto as shown above. The location was shown as asterisk 1 in the map. 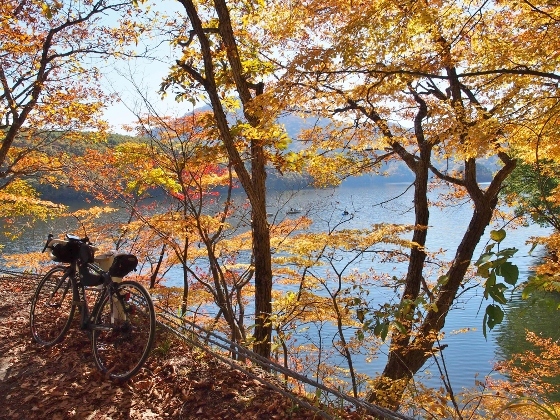 Above photos show the autumn colored leaves along the cycling road with the background of Lake Akimoto. I finally came to the end of the cycling road and then walked along the Nakatsugawa River towards Nakatsugawa Valley. 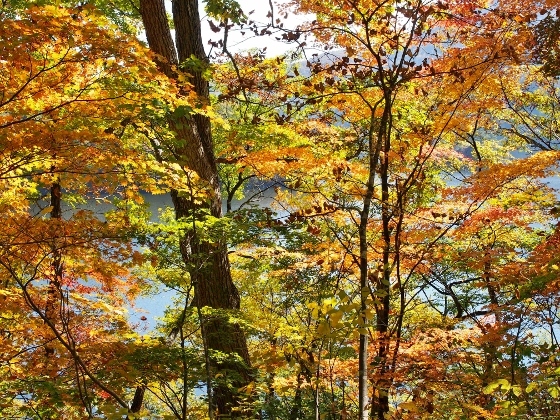 After around 2.5km walk, I found the views of autumn colored leaves along the valley as shown above. The location is shown as asterisk 2 in the map. I also can pedal along the Lake Line Road on the mountains and look down the valley from the bridge, though this time I went from the ground. 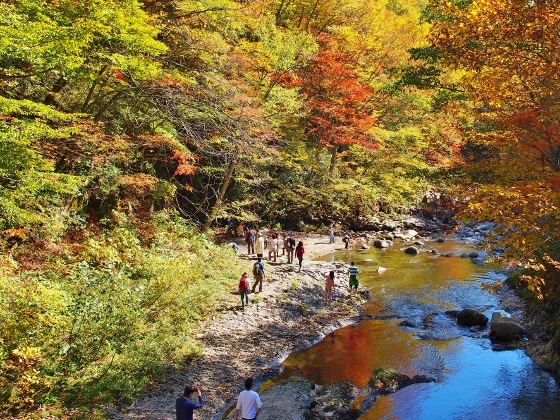 The autumn leaves will keep their best colors through the end of this month. Again, above photo shows a view of Lake Akimoto on the way back. The color of the surface water looks beautiful. 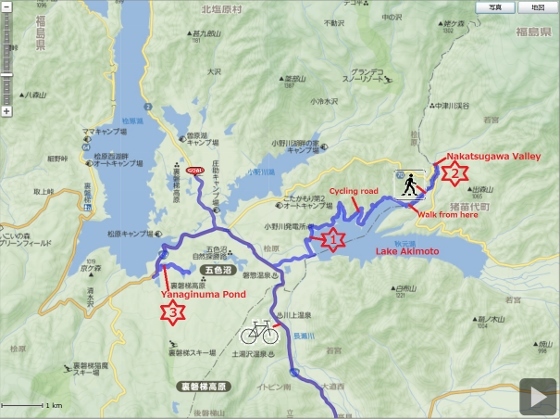 I then pedaled towards northwest and visited western edge of Goshikinuma Ponds. 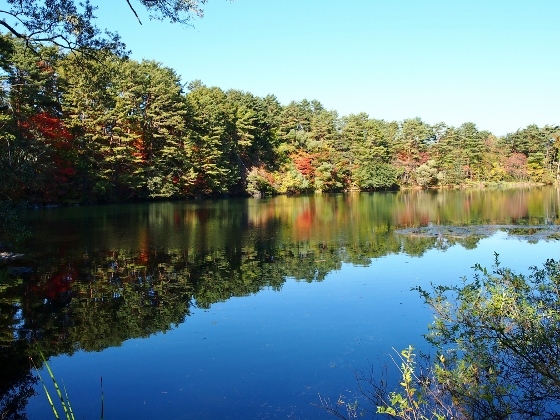 Above photo shows Yanaginuma Pond at the entrance. The location was red asterisk 3 in the map.